Baby: baptism, birth or baby shower There are 7 products. Our pure butter «Baby» cupcakes are perfect for for a birth gift, baptism or baby shower. 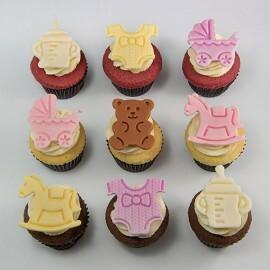 Marshmallow fondant decorations include : baby jumpsuit, baby carriage, Wooden horse, Teddy bear and feeding-bottle. Available in boy or girl version. You wish to celebrate a birth, a baby shower or a baby birthday? Our pure butter cupcakes decorated with these pretty illustrations of animals, boats or baby items made of marshmallow fondant will be a success! To highlight the baptism of your children, try our personalized pure butter cupcakes decorated with pink or blue crosses printed on marshmallow fondant shapes! Looking for cupcakes for a baptism, a birth or a kid’s birthday party? 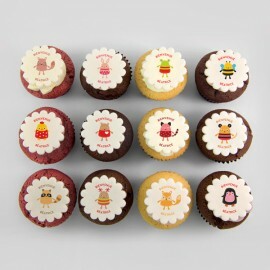 Our pure butter cupcakes decorated with animals and even sportive animals made of marshmallow fondant will be perfect. Nobody can resist them! 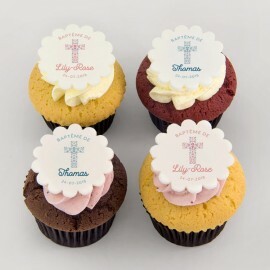 Looking for cupcakes for a baptism, a birth or a kid’s birthday party? Our pure butter cupcakes decorated with lions made of marshmallow fondant will be perfect. Nobody can resist them!